No matter what Rick Perry says, Texas won’t secede. What we can do is split the state five ways. It won’t change much politically, but it would keep North Texas’ money here. Forget about Texas seceding. Remember that plan? In April, governor Rick Perry threatened to have Texas secede from the union if Barack Obama’s stimulus package went through. Unfortunately for Perry and the other quarter or so of Texans who tell pollsters they would like to form an independent country, Texas has no more and no less right to secede than any of the other 49 states. The federal government profits from Texas—collecting more in tax revenues than it gives back in services—and it would never be allowed to secede. The answers are not clear. To find them we first must divide Texas five ways. Technically, Texas does not have the right to divide itself up into five new states. Rather, it can spawn as many as four new states; whatever is left over would be called “Texas.” This portion of the state gets to keep the Texas moniker because it contains the current state capital, Austin, and because it is in the middle of Texas’ present territory. 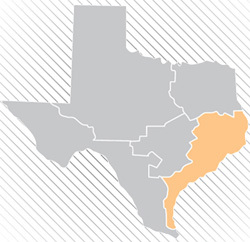 (Although for clarity I refer to this region as “New Texas.”) However, it would actually be the smallest, area-wise, of the five “new” states: less than 25,000 square miles, consisting of Austin and its suburbs, College Station, and a little bit of Hill Country. New Texas would be the closest of the five new territories to a swing state, its six electoral votes usually in play as Democrats sought to turn out enough votes in Austin to fend off a heavy Republican advantage in the suburban and rural portions of Hill Country. In 2008, Democrats would have lost that battle by the slimmest of margins, with Barack Obama losing to John McCain by around 50,000 votes. This region’s name, Trinity, is a sort of triple entendre, referring to the Trinity River, to the trinity of large cities (Dallas, Fort Worth, Arlington) that make up the area, and as an homage of sorts to the region’s fairly high numbers of religious voters. 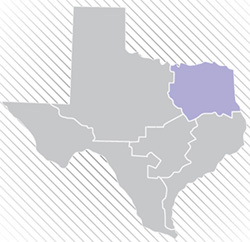 Trinity would be the wealthiest of the new states of Texas. It would also contain a relatively large African-American population. Democrats, however, would have little chance of competing for its 12 electoral votes. Although Barack Obama won Dallas County on November 4, it was literally the only county that he won in Trinity, and overall the territory would be a point or two redder than the current state of Texas is as a whole. Democrats might have an opportunity, however, at picking up one of its two Senate seats if they nominated a pro-business moderate—they currently hold about one-third of the Senate seats in states where they are at roughly this degree of partisan disadvantage (think Arkansas or South Dakota). This somewhat unusually shaped state, which looks a bit like West Virginia rotated 90 degrees, would contain the greater Houston metro area, while then meandering to include nearly the entirety of the Gulf Coast from the Louisiana border up to (but not including) the state’s southernmost reaches in Cameron County. Gulfland’s economy would be heavily dependant on offshore drilling platforms in the Gulf. There are a few things for Democrats to like about Gulfland. It would be a majority-minority state (although barely) and Barack Obama won Houston’s Harris County in November (also barely). Indeed, it would be a bit more competitive than Trinity, although it would probably take a Southern Democrat to win its electoral votes. This is one of the few parts of the country, however, where Republicans have the momentum—neighboring Louisiana, which went for Bill Clinton in 1992 and 1996, picked John McCain by almost a 20-point margin in November. I have drawn Plainland’s boundaries as generously as possible to extend beyond the Texas panhandle to include mid-size cities like Waco and Wichita Falls. Nevertheless, while containing more than 40 percent of Texas’ former territory, Plainland would have barely more than 2.5 million people. It would also be an exceptionally conservative state—quite possibly the most conservative in the country, as John McCain defeated Barack Obama here by nearly 3 to 1 last November. Its five electoral votes, two senators, and three congressmen would almost certainly be for the Republicans. 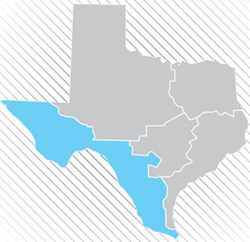 To our final region we give the ironic name El Norte—ironic because, although “El Norte” is the Spanish term for “The North,” this would actually be Texas’ southernmost (and westernmost) region. But it would be impossible to define El Norte by anything other than through reference to its Hispanic culture and its proximity to Mexico, as about 72 percent of its residents have Hispanic ancestry. When I originally drew the boundaries of El Norte, it hugged the Mexican border; its largest city would thus be El Paso. I have since modified it, however, to include Bexar County and some of its adjoining areas, which means that San Antonio would be its capital. Either way, however, El Norte wouldn’t be much more competitive than, say, New Jersey (or its neighbor New Mexico)—Barack Obama would have carried it by 16 to 17 points last November, and Democrats would be heavily favored to win its seats in Congress. Texas currently holds 34 electoral votes, 32 for its representatives and two for its senators. These electoral votes have been won by Republicans every year since 1980 and look to be safely in the Republican column for at least the next two elections, although it’s possible a Southern or Hispanic Democrat might have a chance to put them in play. If Texas were divided into five states, its number of senators would increase from two to 10, and its number of electoral votes from 34 to 42. This would seem at first glance to benefit the Republicans—but it actually might not if the state were divided along the lines I have suggested. This is because, if Democrats merely won El Norte and its eight electoral votes, which they would be almost assured of doing, they would give up a net of 26 electoral votes to the Republicans (34 less eight), which is somewhat better than the 34-vote gain that Republicans get by winning Texas currently. If Democrats also turned out enough voters in Austin to win New Texas (six electoral votes), this would really put the Republicans at a disadvantage, as they’d then gain a net of just 14 votes (28 less 14) from Texas’ former territories. Texas will gain additional electoral votes—probably four although possibly just three—from the re-apportionment following the 2010 Census. Those additional electoral votes would be awarded, in order, to Gulfland (giving it 12 electoral votes rather than 11), Plainland (giving it six rather than five), Trinity (13 rather than 12), and New Texas (seven rather than six); El Norte would have some ways to go before picking up a 9th electoral vote. The disposition of four of the 10 Senate seats from the new states of Texas would be foregone conclusions; Republicans would win the two seats in Plainland, and Democrats would win two from El Norte. The senate seats in New Texas would most likely be split between the paries, while on average the Democrats would stand to pick off one of the four Senate seats between Trinity or, more likely, Gulfland. This would give them a total of four seats to the Republicans’ six, a net loss of two seats that is no worse than the 2 to 0 disadvantage they are operating from currently. If my plan were chosen, dividing Texas into five states would have fairly neutral effects, slightly hurting the Democrats in the Senate while helping them in the Electoral College. Politically, at least, that’s not much of a rationale for Rick Perry—or anyone else, really—to bother messing with it.